Here is my grandfather in 1918. He has a Karl Troop Cross (Karl-Truppen-Kreuz), 1916. I thought this was only awarded to the Army troops. My grandfather had these in his medals box and I am trying to find out more about them. What might have gone on the ribbon? My great grandfather was a Pharmacist in the AH Army before and during WW1. He passed away in 1920 so not sure this was his. 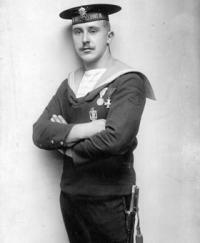 My grandfather was a Submariner in the K.u.K Navy in WW1 and became an officer in the Austria First Republic Army. Maybe he joined this Veteran's group after WW1. Response to ID 132 Von Thronstahl' Opa was on board U-4 from 1913 to 1917. Pardon my ignorance but what does Matrose mean. Can anyone tell me something about this German patriotic insignia? Also would anyone have an idea what type of medal would have on on this suspension? Here are mine. Straight pin also. Here are some others I found on the web several years back. Do you think it went with this? It was in the box also. I did find this Iron Cross in the box of my Grandfather's and Great Grandfather's Medals. On another site I was told it did not belong together. They were the only two items - Cross with no ribbon and ribbon with no medal. Possible? Can anyone identify this ribbon? Hello Paul, I have one of these as well as a suspended sweetheart pendant. I am of the opinion that these are period because these are the only two I have seen. It is probably my fault. Everytime I consider selling off some of my collection the prices drop drastically. Many thanks Gents, Also I have many more Russian medals and badges I picked up back in the early '90s. Is there a reputable price guide and a reference book for Russian pieces?